Colony Collapse, by J.A. Tyler. Portland, Oregon: Lazy Fascist Press. 136 pages. $11.95, paper. “I started the search for my brother by building a house,” the narrator begins in J.A. 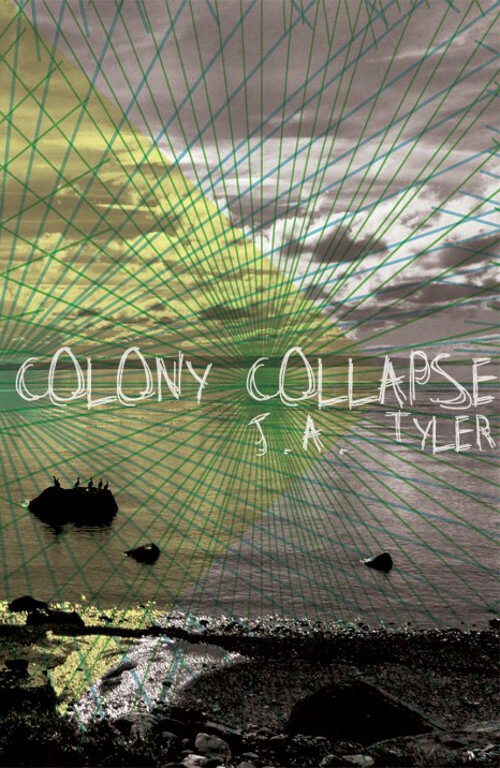 Tyler’s book of prose, Colony Collapse. And, though the narrator starts his search with building, he also burns, demolishes, and rebuilds. It is through these actions that the reader is able to enter the strange, dreamlike, and disembodied world that Tyler has created. By entering this new world, a reader is able to experience Tyler’s true talent with lyric. The language is rich and is later stripped and rebuilt—forming a new rhythm out of the same language. The acrobatics in the poetry work to create the feel that the very world a reader is standing on is subtly being pulled right under his feet. Colony Collapse is not a quick read. Instead, one needs to take the time to savor the musicality of the language and to enjoy the dreamlike world that Tyler has created. Tyler orients his reader with a few tangible items—the house, the woods, the brother, a few animals—deer, bears, and foxes—but those items quickly intertwine, collapse, and are rebuilt to form new understandings of nature, relationships, and desires. Underneath the relationship between these items are the narrator’s acts of building, destroying, and rebuilding. In this fashion, the various vignettes are sestina-like—repeated symbols and words—with the repetition actively working to create new meaning and understanding of the relationship the narrator has to his setting. There is also the sense of entrapment—as though the narrator (and the reader) cannot get out of the confines of the woods. The narrator is always searching the setting for himself. The woods are characterized as a prison and at other times, a lush world of immense possibility. At times, the search for the brother within those woods is haunting. At other times, the search is almost comedic. The narrator constructs this characterization with the following: “In these woods, there is no returning”, “In these woods I will not give up. I will not die in this purgatory”, “I am lost in these woods”, “In these woods, the only longing is to find a way out”, “In these woods, I refuse to die”, and “In these woods, I have already been told of my death”. The narrator challenges what the woods may contain by actively fighting against them through various acts of burning and rebuilding. My brother is a deer and we were a herd. He is nearby, breathing. I can smell his hide. I can feel the black cold of his eyes on my deer-body. We were brothers running a river, but my brother and I, when we were deer-children, the river ran into an open field, disappeared into musket-sunsets and a meadow’s song. The act of being a part of a “herd” is something that Tyler explores in other ways—using foxes, bears, daughters, and other deer-children. Though these relationships may not be easily recognized by a reader—the familiarity of desire will be and the challenge with connecting with another is universal. Tyler’s verses read like well-polished stones carefully polished and set into place inside an intricate woven path. The poetics are sophisticated and challenge the reader to let go of what is familiar and enter fully into the dream. The narrator reminds that, “In these woods, I imagine the impossible, which is how we survive”. In short, getting lost in “these woods” is an interesting experience and can benefit any reader if he lets it. Colony Collapse at Powell’s City of Books. Colony Collapse at Lazy Fascist Press. Kate Kimball received an MFA from Virginia Tech in 2010. Her work has appeared in Kestrel, Weber, Ellipsis, Hawaii Review, and Midwest Literary Magazine, among others.